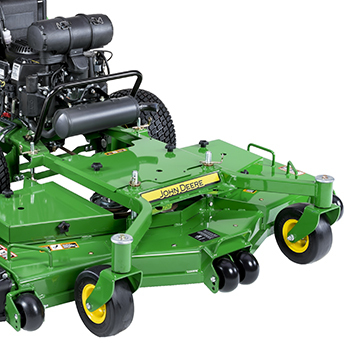 Caster wheels are set in as close to the mower as possible. 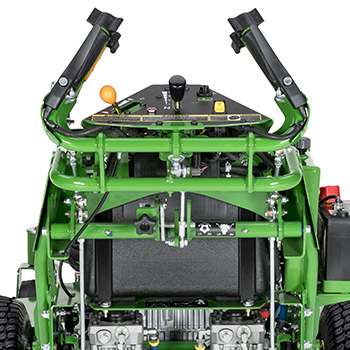 The compact design of John Deere commercial walk-behind mowers allows access to operate in tight areas where larger ride-on machines cannot fit. 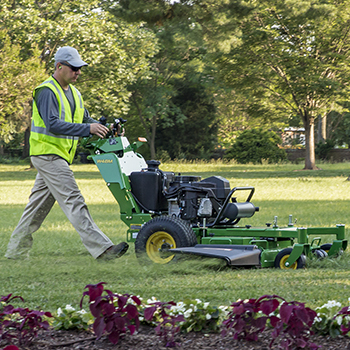 Often, this means the area can be mowed with a walk-behind mower so it is not necessary to switch to another mower, which helps reduce the time on site. 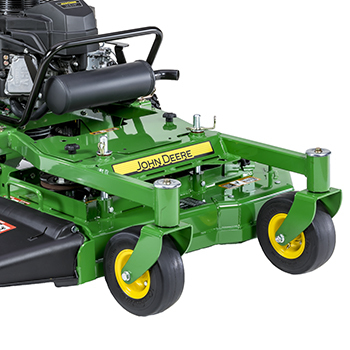 With the compact design of John Deere commercial walk-behind mowers, less space is required on a truck or trailer, possibly freeing up space for an extra mower, resulting in less time on property, saving both time and money. 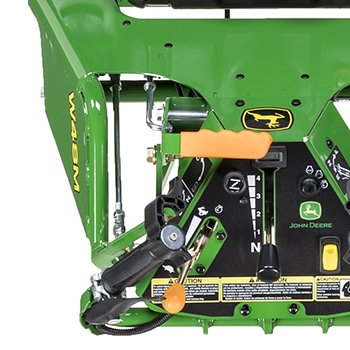 The compact design makes the machine easier to maneuver. 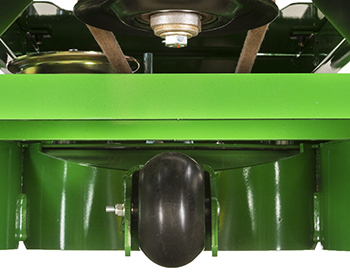 Caster wheels are set close to the blades for most effective ground following capability. 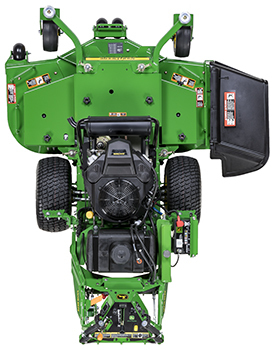 Compact design takes less space for mowing tighter areas. Front and rear tie down points are provided to aid in transport. Allows ability to secure straps pulling in opposite directions to keep unit from rolling during transport. 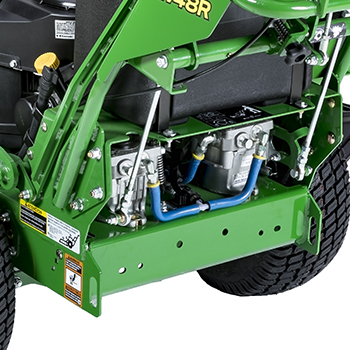 Rear tires are sized for the machine and mower width to give optimum deck overhang for trimming performance. Front caster wheels are designed for the best performance. 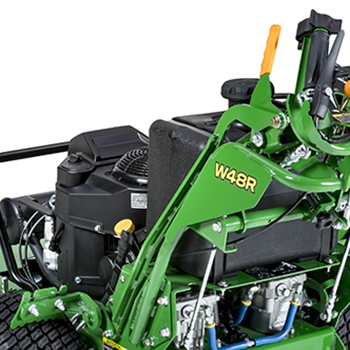 W61R Commercial Walk-Behind Mower has an electronic fuel injected (EFI) air-cooled, vertical-shaft engine. 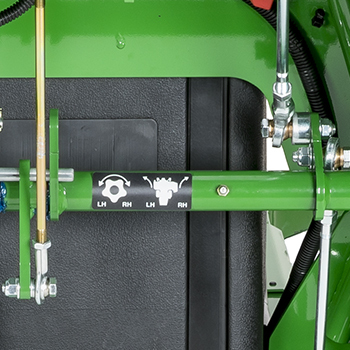 EFI allows for fast starts without use of a choke - no choke lever is needed. Starts are quick and easy, even for inexperienced operators. Fast, reliable starts are routine just like with a modern automobile. 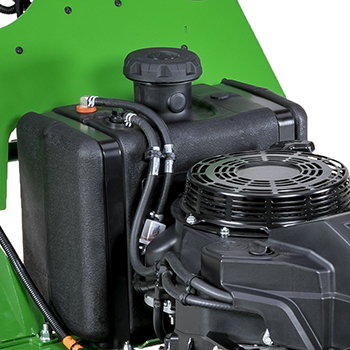 EFI automatically meters fuel, including the extra fuel needed to start a cold engine, eliminating flooding from unnecessarily choking a warm engine. No carburetor adjustments are needed at altitude. 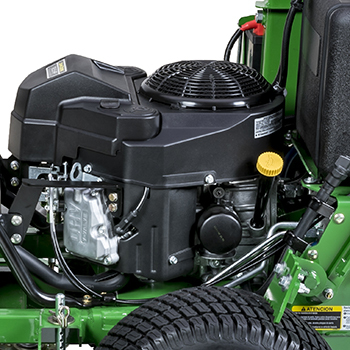 There are no choke-related problems since the choke is eliminated, thus ensuring operator confidence and quick starts, even in cold ambient temperatures (snow blower use). 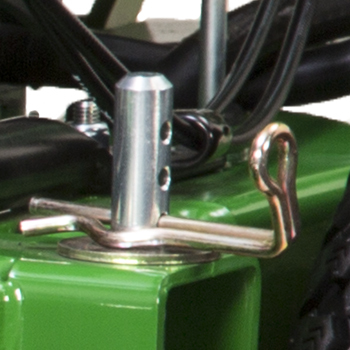 The mechanical throttle cable is replaced by an electric linkage that is not susceptible to wear or freezing. Cost of ownership is reduced. 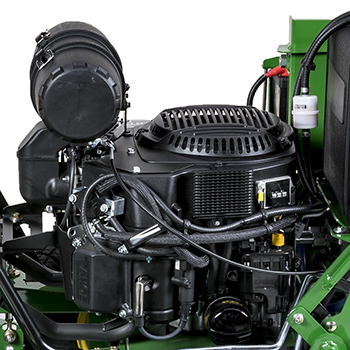 EFI precisely meters fuel to each engine cylinder. 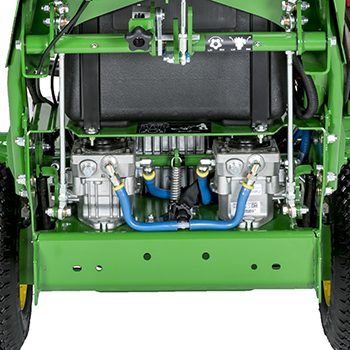 Fuel usage can be expected to be about 10 percent less than with a similar carbureted tractor. Maintenance expenses are reduced because of fewer complaints related to hard starting, vapor lock, misfire, run-on, or fouled spark plugs. Large, 5.4-gal. 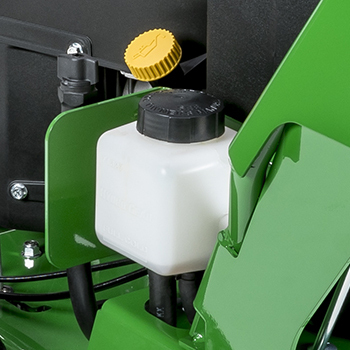 (20.4-L) top draw fuel tank is easy to fill with large filler opening in an easy-to-reach location. 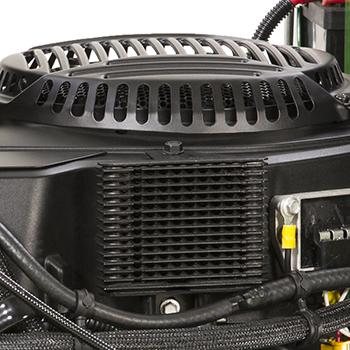 Powerful, 300-CCA battery is secured and protected from damage in an easy-to-access location. Wheel motors power the rear drive wheels. Steel oil tubes between the pumps and wheel motors are used for maximum reliability. 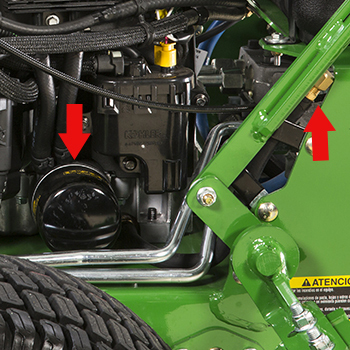 A transmission oil reservoir is located next to the fuel tank for easy checking. Sight glass for checking oil level without opening hydraulic system minimizes risk of contamination entering the system. 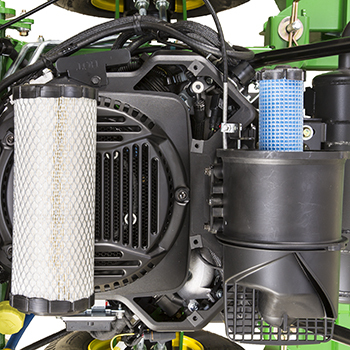 The transmission oil filter is a replaceable spin-on type for easy service. 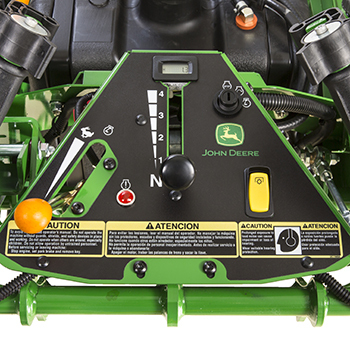 Color-coded and clearly marked levers, switches, and buttons enable simplified operation. Bilingual decals in English and Spanish are provided. 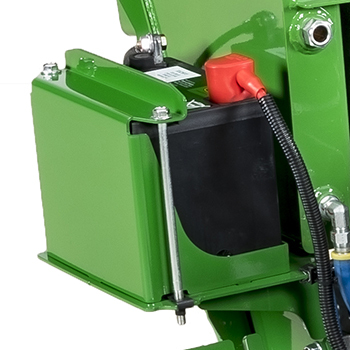 The operator presence system requires that one of the bails must be depressed to operate the unit; the machine must be in neutral and the power take-off (PTO) must be disengaged to start. 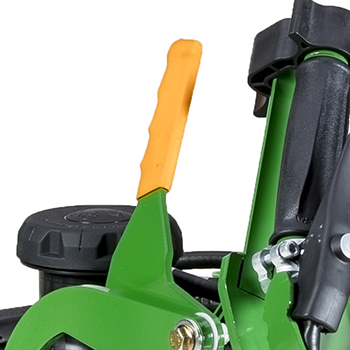 Operator presence control levers are recessed into control handle when engaged, provides a smooth contour and comfortable handle to hold during operation. Separate choke and throttle – This takes the guesswork out of choke operation, with less chance of fowling the spark plugs. 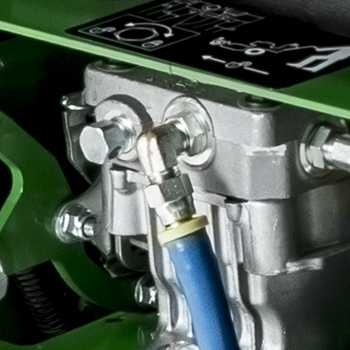 The W61R model with electronic fuel injection (EFI) does not require a choke. 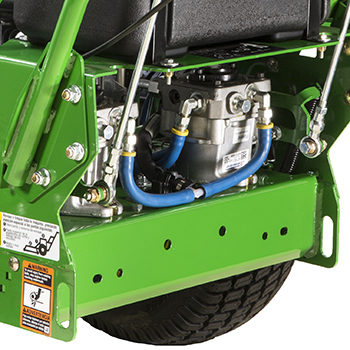 Electric PTO clutch on the engine powers the mower deck. 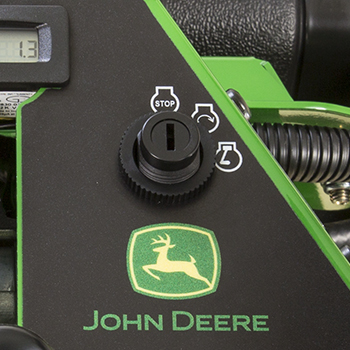 The PTO switch on the dash is easy to see and use. 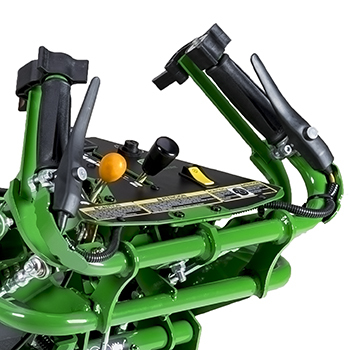 Speed and steering controls are designed for ease of operation. 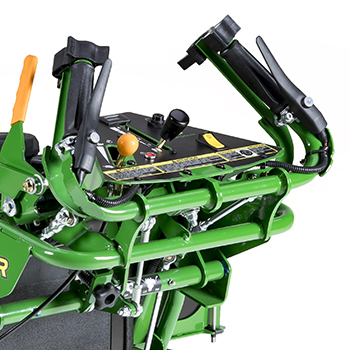 Ergonomically designed control configuration on all units gives good operator comfort and leverage while driving. 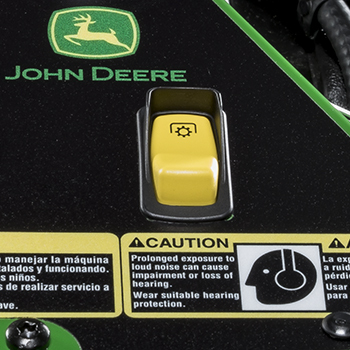 A speed-control lever is conveniently located in the center of the console and used to set maximum desired speed. Low actuation force is required for operator comfort. The neutral lock is spring-loaded for easy release. 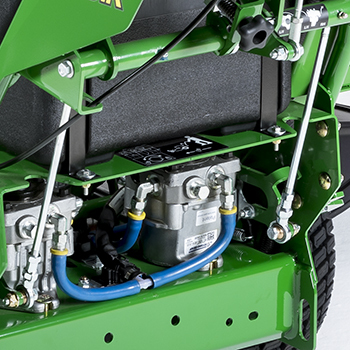 A convenient and easy-to-operate switch is located on the console to operate the electric clutch, which powers the mower deck. 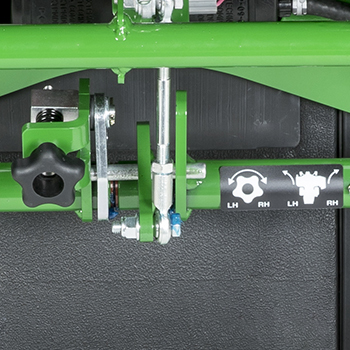 Before the engine will start, the transmission speed control lever must be locked in neutral, the parking brake set, the power take-off (PTO) disengaged, and the key switch turned to the on position. Left- and right-hand speed/direction control levers are locked in neutral by spring-loaded knobs on the end of control handles. The knob has a finger lever, making it easy to move to the locked position while holding the control lever in the neutral position. 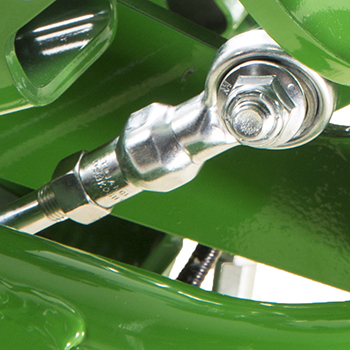 The locking knob is spring loaded for easy release of the control levers. Separate choke and throttle – this takes the guesswork out of choke operation, and there is less chance of fouling the spark plugs. 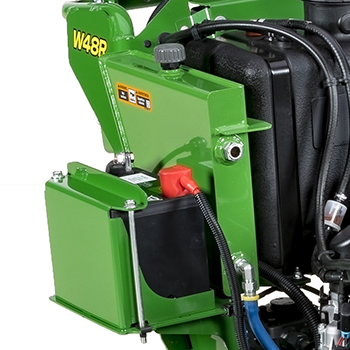 The W61R has electronic fuel injection (EFI) and does not require a choke control. Color-coded and clearly marked switches and buttons are easy to find. Oil drain tubes are provided to reduce oil spills and mess. Cleanout ports make inspecting and cleaning engine cooling fins easy. 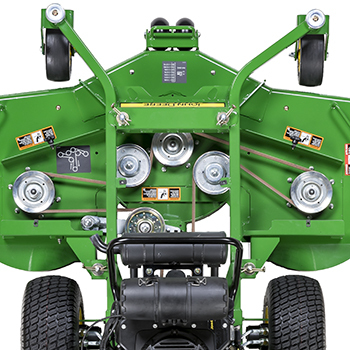 Control linkages are positioned tightly to the main frame structure to protect them from damage, such as being bent that could impact the speed and tracking of the unit. 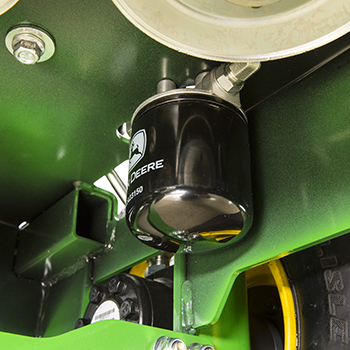 Transmission oil reservoirs are easy to access and fill. Transmission tow valves are easy to find and use. Front and rear tie-down points are provided to aid in transport. More-rounded corners contribute to a clean, attractive appearance. 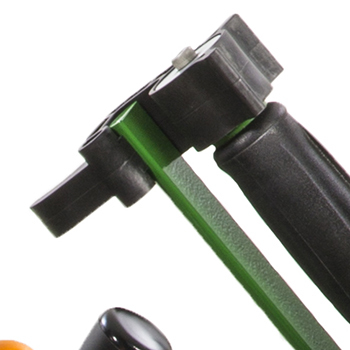 Greater strength results from eliminating sharp angles where peak loads can cause failure. 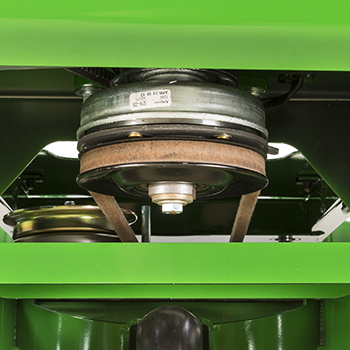 Floating suspension enables the best possible cut. Reinforced front lower edge provides strength and durability. 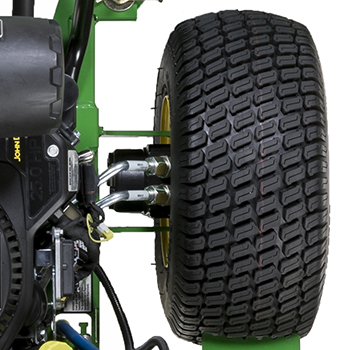 Four mower front wheels are double-captured for durability and adjustable to three positions to suit the cut height. 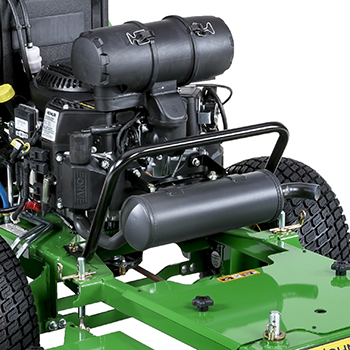 Two-coat paint covering protects the mower deck and resists corrosion. Deep-deck design for superior capacity. 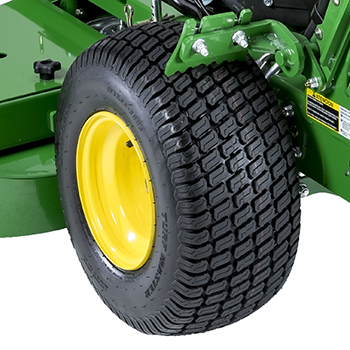 Side and center anti-scalp wheels promote a smooth mowing job. 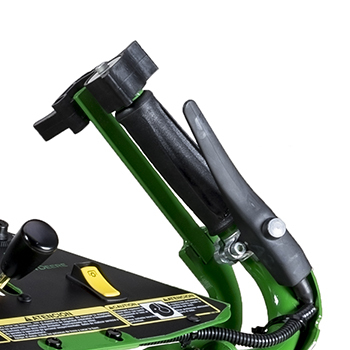 Hardened steel blades extend cutting time and increase durability. 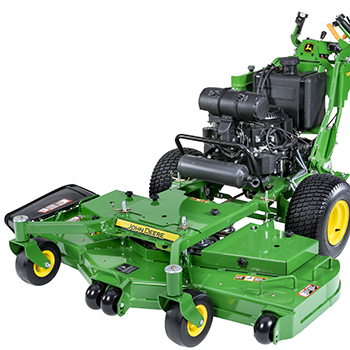 High blade-tip speed of approximately 18,000 fpm (5,486 m/min) for more blade strikes per inch mowed. 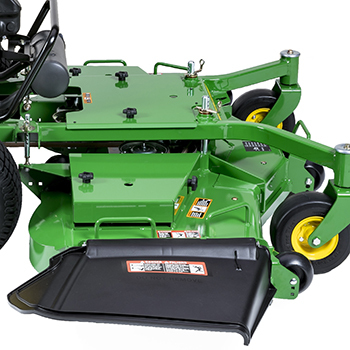 R Series mower decks include a rear wheel for additional anti-scalp protection. 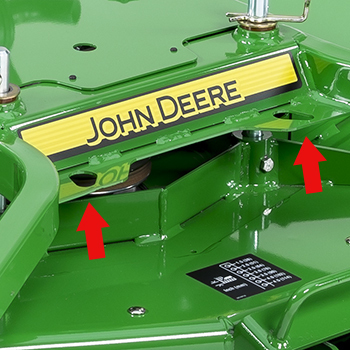 Wide, formed discharge deflector provides even clipping distribution. Large discharge deflector evenly disperses expelled clippings. 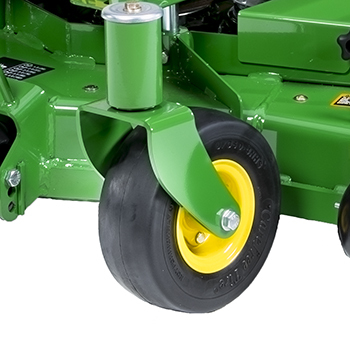 Caster wheels are close to the mower deck to reduce vehicle footprint and turning radius. With the wheels less exposed, there is less chance they will get snagged by immovable obstacles, thus improving maneuverability and reducing chance of damage. 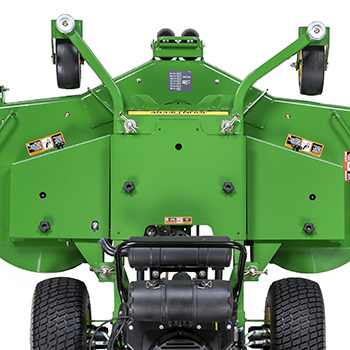 The high-performance mulching attachment includes formed steel baffles to control the material for superior performance. Special mulching blades can also be used for side discharging, though overall cutting performance may be slightly less than with the standard blades. The free-floating deck gives a smoother, more level cut. Height-of-cut changes can be made without tools. 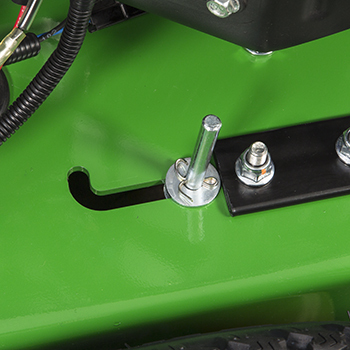 Large handles are provided to facilitate lifting the mower deck for setting the cut height. 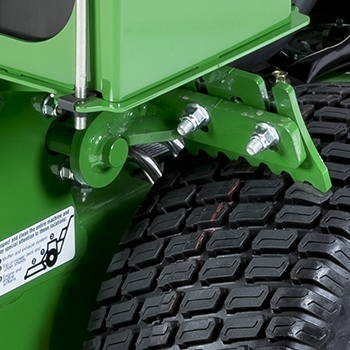 Cut-height adjustment pins have 90-degree bend for easy removal and reinstallation. 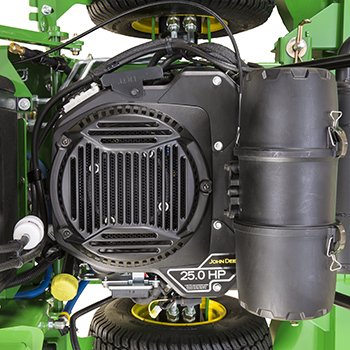 Easy-attach belt shields allow for quick access for service. 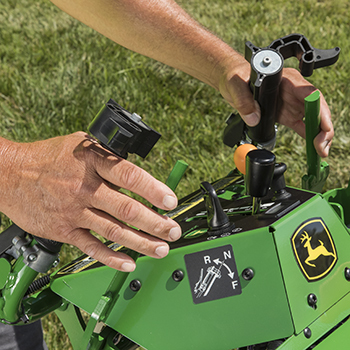 Four hand knobs allow removal of both mower shields. 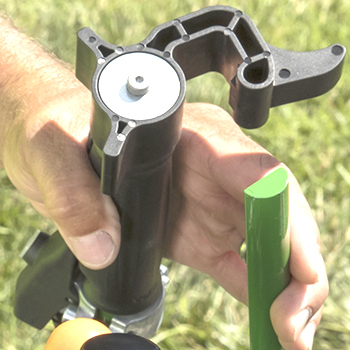 Greaseable spindles with easy, top access for simplified servicing. Spindle grease fittings can be greased with shields in place. 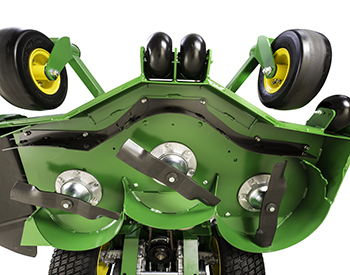 Special mulching blades can also be used when side discharging, though overall cutting performance may be slightly less than with the standard blades. 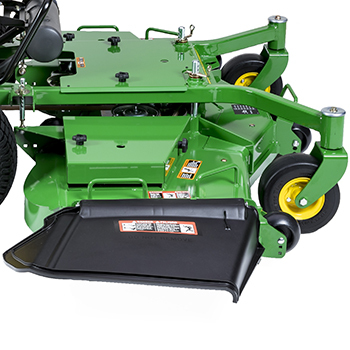 The mulching attachment allows for conversion of the mower deck so it can be used to perform the mulching function (grass or leaves). 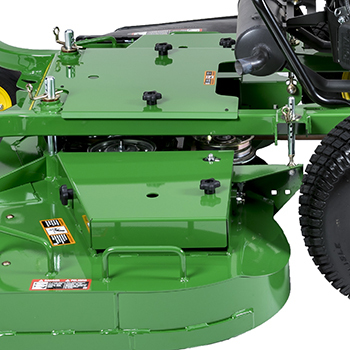 No more than one-third of the grass blade should be cut off at one time. This allows more efficient mulching and will promote the continued good health of the grass. 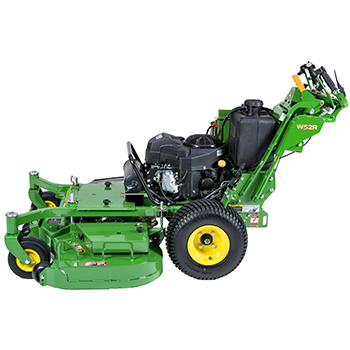 If the desired cut height cannot be achieved by cutting off one-third, or there is clumping of the clippings, it may be required to cut higher, wait a day, then lower the mower and make a second pass. Mow at proper intervals, approximately every four to five days. 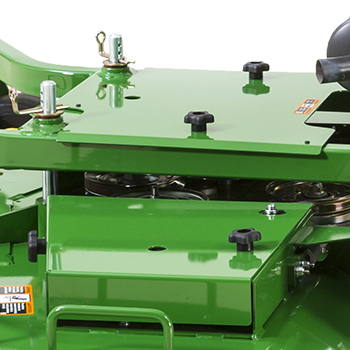 Adjust ground speed to allow the mower deck to process the clippings effectively. Deflector up for storage - 65 in.